1. Remind myself that it is never okay to hurt others – many children immediately lash out at others (physically or verbally) as a first reaction when they feel angry, frustrated or upset. This is not okay and as it is that first reaction, the reminder not to do it becomes the first point. 2. Take 3 deep breaths or count slowly to 10 – these are both very simple and immediate calm down techniques that children can use to give them a little time and space to try and negotiate a solution to the problem that is occurring. 4. Ask for help to solve the problem – children will not always be able to solve a problem by themselves and asking for help involves you as a support person in the problem solving process. 5. Take the time I need to calm down – a solution to please everyone won’t always be found, and in these instances if the big feelings continue to be an issue for your child a suggestion that they take some time to calm down can be helpful (some children will even say themselves, “I need some time alone!). 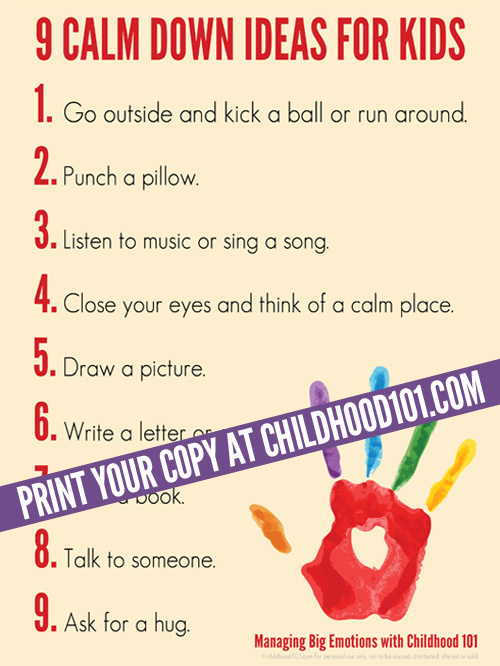 That is where the following calm down ideas can help your child discharge these feelings safely. 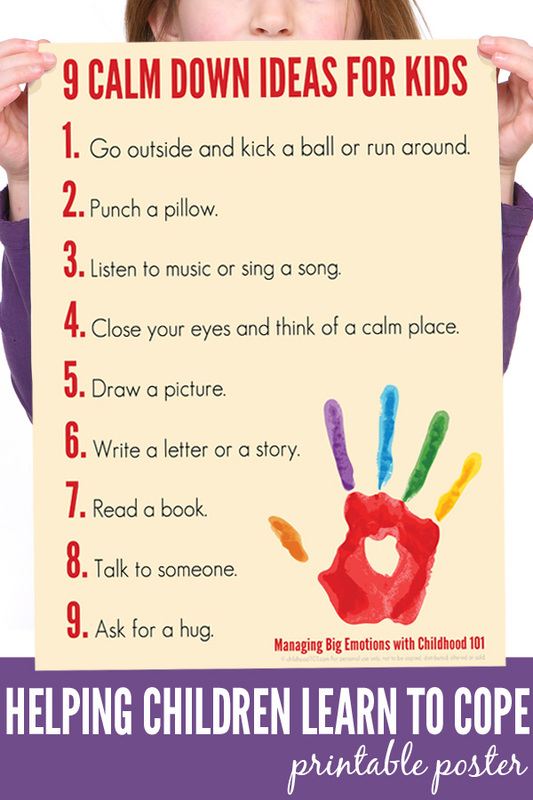 So here are some safe ways that children can resolve their big feelings without hurting themselves or others. 1. Go outside and kick a ball or run around: the physical activity is a great outlet for overwhelming emotions and nature is a great healer. 2. Punch a pillow: a safe way to let off steam when managing angry or frustrated feelings. 3. Listen to music or sing a song: one for children who find music comforting. 4. Close your eyes and think of a calm place: a great relaxation tool for kids, this is one to practise with them at other times (before sleep is a great time) so that they can call on it when they are struggling with emotions. 7. Read a book: one for children who find reading provides a sense of relief from other pressures. 8. Talk to someone: I always call my husband or my mum when I am struggling with big emotions and your child might need that same exact support to process what they are feeling. 9. Ask for a hug: some children will find comfort in close physical contact when they are feeling overwhelmed. One final point – these posters are as much, if not more, for the parent or significant adult helping the child manage these emotions, as they are for the child. They are a tool to open discussion with your child about having a calm down plan and they can act as a visual prompt to help you (the adult) as you guide your child in that moment when they are struggling to manage. You know your child best and so while this process will work well for some children, it may not work for others. In the same way, their effectiveness will depend on the age and development of your child. I share these as a tool that might just work in your parenting toolkit. 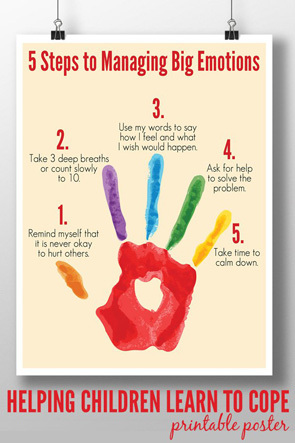 This poster works as a companion to the 5 Steps to Managing Big Emotions Poster. I suggest printing it out and talking with your children about what their preferred calm down methods are (be sure to share you own with them too). 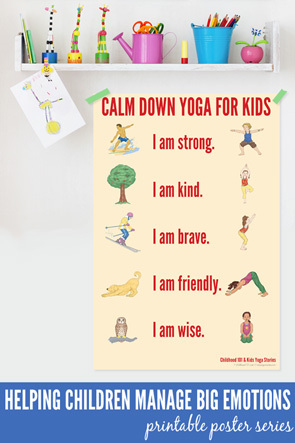 Display the two posters together in your child’s bedroom, playroom or your family living areas as a helpful prompt for working through these big emotions together. To download your poster: Click on the poster image below. This will open a larger PDF version that you can download to your own computer. Open the PDF and print. When printing, select “Fit to printable area” (or similar) to ensure the page fits with your printer type and local paper size (these have been created at A4 size). I printed ours onto matte photo paper. Personal, non commercial use only. I could do with this step-by-step plan myself sometimes, when emotions get the better of me - as well as helping my children to calm down. Trouble is, flashpoints for me and the children are usually when we are in a hurry to get somewhere, so taking time to calm down is really hard. I agree with Melanie. But i have found playing soft (classical) music in the car can help to diffuse the heavy emotions fairly quickly even when you can't escape that space. it won't let me get to PDF to save it and print it!!! Very frustrating, when I click on the poster it just comes up with pin it which I've already done. Thanks that helped, can I get to all the posters in that series please? I like these ideas for the exception of 'punching a pillow'. My way of thinking is more in alignment with Thich Nahn Hanh in his book regarding anger. He reminds us that even though many practices are acceptable to the modern world, to practice punching, or any other expression of emotions that is not healthy, as an outlet of anger is not a good practice for a life or harmony. Therefore, in my way of thinking, to add it to a beautiful awareness based practice and learning seems misaligned. I agree. Punching anything is practicing aggression. I prefer recommending a good stomp around the yard or do the "anger dance" - put on some lively music and boogie your anger away. I am trying to save the posters and then print. It asks me for a password before I can save. I tried the additional links above as well but still the same. Can you help? Hi, these posters are fantastic but unfortunately the link does not seem to work anymore. When I click both on the poster link and on the goggle drive links which you have provided in the comments section it says "This page can't be displayed". Can you help? Hi Lisa - that is odd as they are working fine for me. Maybe try in a different browser? Thankyou thankyou THANKYOU!! These posters are exactly what i need... oh I'm so grateful you made them! It would be great to post them in Spanish as well!